It’s a beautiful sunny day in May. I am seven and a half years old. My first year of school is almost over. We had the finals last week, and now it’s just day trips, games outside, and going over the summer homework. I am the best at reading in my class, because I can read 120 words a minute, measured by a little cute sand clock. I had 4 problems wrong. They were simple problems like I’ve done a lot of before. I… I DON’T fail math. And my parents will be so angry at me, I can’t even go home. The tears poured out of my eyes. I didn’t care if the other kids laughed at my sobbing. I had to be taken out of the classroom. I walked home with my friends, and I cried all the way. I didn’t understand what happened. A week later my mom took me to see an eye doctor. As it turned out, my eyesight went bad. 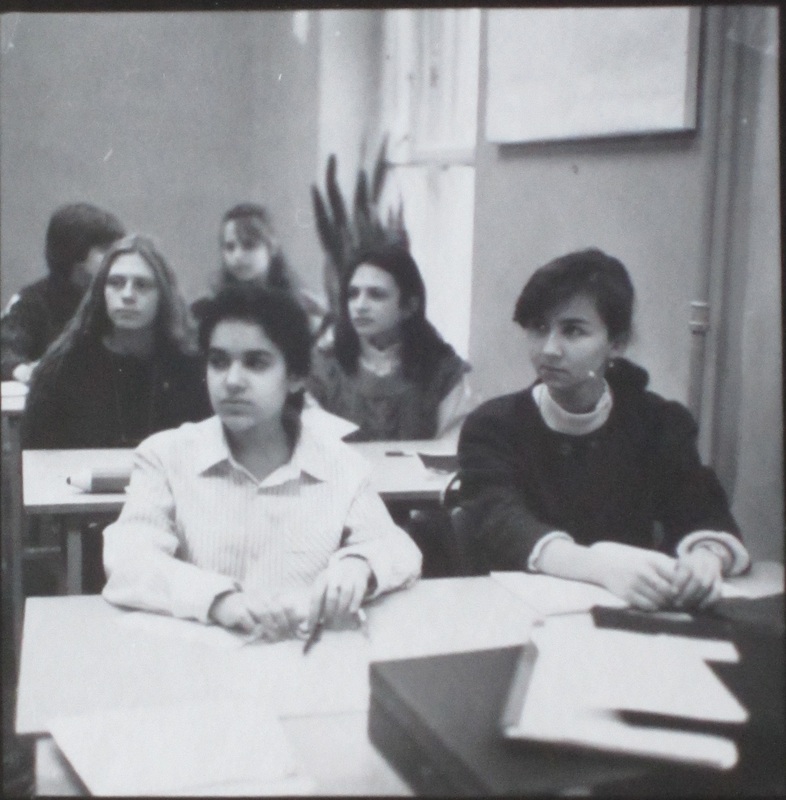 From the fifth row, where I sat as a relatively tall kid and a good student, I couldn’t see the numbers written on the blackboard clearly any more. I was allowed to correct my math test and finish the first grade with the perfect report card, but there was something I would never get back. My eyesight. The doctor said it would only be getting worse over time. From then on I would have to wear ugly brown glasses at school, and sit upfront with bad students and other four-eyes. Soon I might have to wear glasses all the time like my mom, even though I am only a kid. Nine years later, as I was about to graduate an elite math and physics high school, I could no longer read a book in my outstretched arms without glasses. Even though there were no bad students and plenty of cool bespectacled kids around me now, I would not wear the glasses outside of classroom or a movie theater. Partially because I wanted to look cute, but mainly because I was afraid that once I’d start wearing them all the time, there would be no way back. One long spring evening of my graduation year, I was visiting my high school best friend Zulya. Zulya’s mom made us some tea and joined us. We have just been laughing about our year book photo session. You can tell that this supposedly candid shot is staged, because neither of us can see anything on that blackboard we attend to so earnestly. We took our glasses off the second the photographer walked in. “How bad is your eyesight?” Zulya’s mom asked me. Minus 3 and and half and minus 4 and a half. She shook her head. You are two silly girls, she said. Do you realize that you are depriving yourselves of so many colors and so much beauty of the world by walking around blind?! A few weeks later, after I graduated with the perfect report card, my mom and I went to an optics store and mom let me pick nice golden frame oval glasses. I started wearing them most of the time. Zulya’s mom was right: the world, with its stars, and flowers, works of art, and people’s eyes and smiles was worth seeing. And – I was right too. Once you start wearing glasses, there is no way back. Over the years, the glasses were stepped on, misplaced, or left in some guy’s pocket, often at a very inconvenient time and place. Then finally, three years ago, when the next pair broke in my hands, I rolled my half blind eyes, found (with some difficulty) a spare pair from a couple of prescriptions back and made a phone call. Had a vision correction surgery shortly thereafter. The day after the surgery my vision was 20×20. As we grow up, we are faced with many losses, big and small. We accept the big losses and learn to be stronger, and the little ones, and gain something in their place. As it turns out some of the losses don’t have to be as forever as they might seem. I was fortunate to experience all the colors and the beauty of the world again, unrestricted, for the first time since I was seven. Easy. I would give up hearing to just have the perfect eye sight as long as I am alive. No noise during commute! No chatter to interrupt the flow of reading or thinking. Seeing far across bodies of water! Seeing small birds and animals up the trees! Seeing stars glow brighter and brighter as the night settles. But if I get a super-sensitive vision: that’s even more stars, more colors, more depth, more intricacy. Oooh, and will I get infra-reds and ultra-violets? Yes, please! I glad i came across your blog. I enjoyed reading your post! I am glad I came across your blog. I enjoy reading your blog. Loved reading this and an glad that your operation was a success. Sight is something I definitely take for granted and your post really made me think about this simple blessing.